SELLERSBURG—You might think that after being a priest for 27 years, Father Thomas Clegg would have gotten it by now. But this self-described “self-improvement junkie” is driven to learn more about what it means to be a priest in the 21st century, and then to put that into action at St. John Paul II Parish in Sellersburg, where he serves as pastor. A native of Indianapolis who grew up in St. Philip Neri Parish, Father Clegg was drawn to the priesthood as he grew up in the 1960s and 1970s through his love of teaching, of helping others as a firefighter and the prospect of preaching and leading others in worship. His embrace of priestly life and ministry today, though, is rooted in what he’s learned about the ultimate purpose of pastoral leadership in parishes. As driven as he is about priestly life and ministry, Father Clegg started his journey to it in a kind of meandering way. eighth-grade class, he thought he could be a good priest. As it turned out, the pastor convinced eight other boys in the class to enroll at the high school seminary in much the same way. He graduated from the Latin School in 1978, the same year that it closed, and went through a couple of stints in college and major seminary before being ordained in 1990. In the periods in between, Father Clegg worked as a teacher at St. Philip Neri School and followed in his father’s footsteps by serving as a firefighter in the Indianapolis Fire Department. 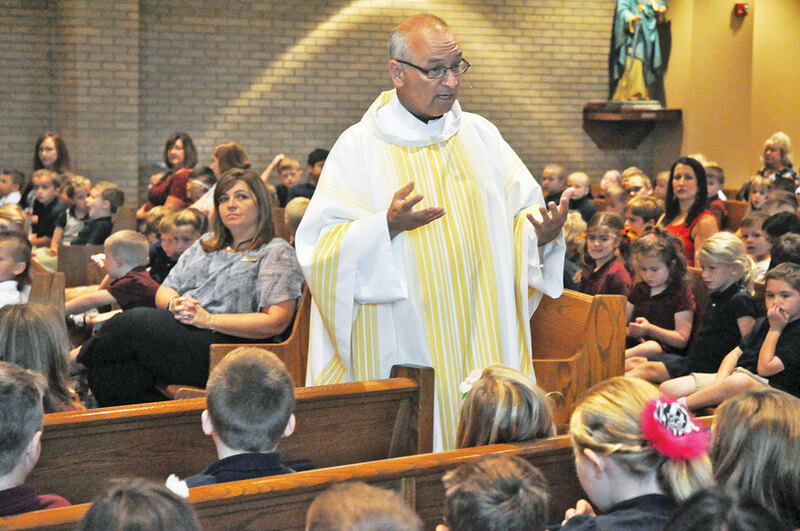 Over his 27 years as a priest, Father Clegg has served as chaplain at Roncalli High School in Indianapolis and in parishes in Indianapolis and the New Albany Deanery. During much of that time, he has led parishes that have either had to merge with or collaborate more closely with a nearby faith community. That trend started in 1992 when Father Clegg led the former St. Catherine of Siena and St. James parishes on Indianapolis’ south side to merge and become Good Shepherd Parish. He later served as pastor of Most Sacred Heart of Jesus and St. Augustine parishes. It was the first time that the two Jeffersonville faith communities had to share a priest. In 2013, Father Clegg was assigned as pastor of St. Joseph and St. Paul parishes, both in Sellersburg. A year later, the two faith communities merged to become St. John Paul II Parish. In all of these cases, Father Clegg says, the parishioners drove the process of coming together. Tom Meier served as pastoral associate with Father Clegg at Good Shepherd Parish and had previously been a longtime member of St. James Parish. 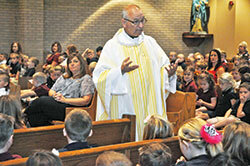 “He was fantastic,” said Meier, who later served as Good Shepherd’s parish life coordinator from 2000-04. “What impressed me most about [his] ability to bring the parishes together was his ability to follow a process and let that process unfold. Susan Wheatley-Huff saw these same qualities in Father Clegg when she served as a pastoral associate at Most Sacred Heart of Jesus Parish in Jeffersonville. It’s the mission of the Church that Father Clegg ultimately says is at the heart of the process of bringing parishes together as one. The mission to make disciples has also led Father Clegg to take 17 mission trips to Haiti, although he isn’t sure who is ministering to whom when he goes there. “For me, when we do our mission trips, I almost like to call them a reverse mission,” he reflected. “We don’t build houses. We don’t paint buildings. We don’t want to take a job out of the hand of a Haitian. And for Father Clegg, relationships—with God and other people—is at the heart of being a priest. Father Clegg encourages men considering the priesthood to nurture their relationship with God.